Hello there! I've updated this hair so now it's compatible with the fat morph and I've also improved the texture. Before uninstalling the old version, make sure NONE of your sims is using it, this way you will avoid any kind of possible crashes/issues. 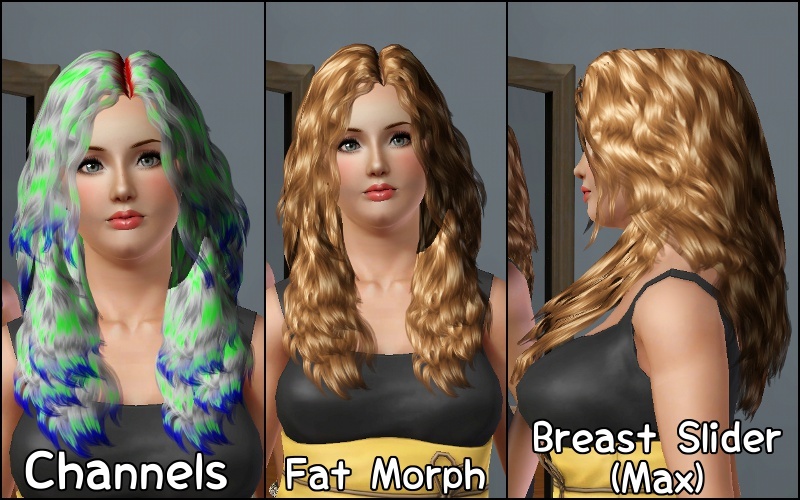 There's is now an optional sims3pack version of this hair, download it here. Hi there! It's such a pity that we don't have enough wavy hair for TS3 that looks natural! But luckily we have Nouk for that! And with her permission, I've converted her beautiful Long Wavy Hair. - This hair works for female teens, young adults, adults and elders. Sorry, I tried with the child/toddler meshes, but they had some glitches I could not fix (yet). Not Nouk's fault at all! - This hair is low-poly (Old PC's friendly! XP), it moves smoothly and it's compatible with the new breast slider. It may look a tiny little blurry because of the way TS3 renders the textures, but trust me, you won't notice this at all during game play. - More info? Check this pic. NoukLongWavyHair_byAnubis360.rar | Description: OUTDATED! Do NOT download! UPDATED_NoukLongWavyHair_byAnubis360.rar | Description: UPDATED VERSION! Please download this one instead the outdated!